The snow crackled like lightbulb glass underfoot as Maxim Balakhovskii stepped out into the stiff wind swirling around the summit of Kamchatka’s Vilyuchinsky volcano. Shading his face from a blinding sunrise, the veteran guide stepped clear of the door of the Mil Mi-8 helicopter, making way for a group of 11 snowboarders he’d signed on to lead to one of the world’s most unbelievable alpine adventures. Turning from the biting wind, Balakhovskii watched as one-by-one, his group stepped off into a snowboarding wonderland of colossal proportions. He took mental snapshots of the unique expressions on each face, as any professional photographer would. Leading this, the latest tour for his adventure travel company HELIPRO onto the breathtaking glacial landscape, he couldn’t help but revel for the 10-dozenth time in the bold spirit of explorers mirrored in their spellbound eyes. Kamchatka is the edge of the world, a peninsula that could only be part of something immense, a destination as big as Russia. The geography of the landmass is suited to Russia, since the world’s biggest country is the one place that has room for the ruggedness and vastness of it. This is a wilderness that daunts even seasoned adventurers. Americans or Canadians may be able to imagine Kamchatka as a place about the size of the Florida peninsula, only a bit more sparsely populated and less accessible than Alaska. The blistering solitude of this secluded sliver of land jutting into the Northern Pacific forces the psyche to adjust and elevates the senses to new thresholds. If you use Google Earth to check out this part of Russia’s Far East, you’ll notice there is only one slender ribbon of gray gravel running through the middle of the province. From most places where Balakhovskii and his colleagues travel, anything you’d classify as “road” is always more than 20 miles away and more often hundreds of miles distant. The region’s biggest city, Petropavlovsk-Kamchatsky, is famous for its proximity to Russia’s largest nuclear submarine base. The town only has 150,000 inhabitants, and the numbers have been dwindling fast. 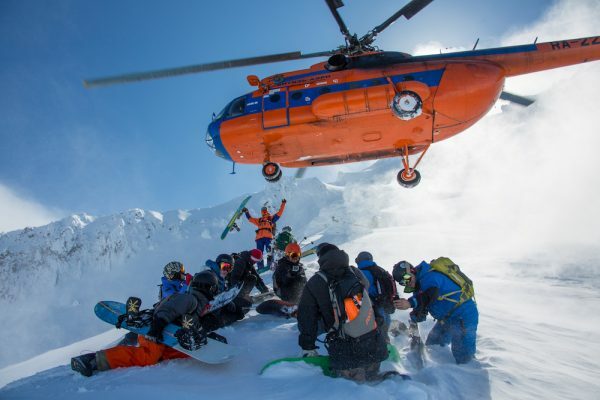 So, for the small group of snowboarders heli-skiing with HELIPRO on this day, Kamchatka must have seemed a place out of some pioneering adventurer’s fantasy, an experience that couldn’t be a solid destination until the bite of Arctic wind rushed through the chopper door. Russia’s easternmost province is at once the middle of nowhere and a sort of eternal home that calls to us at the same time. 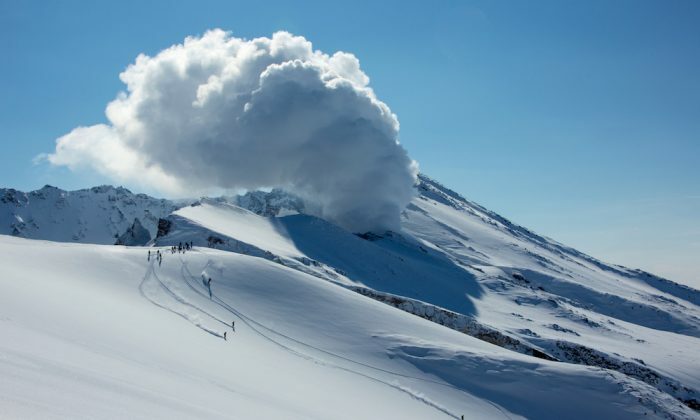 From the pinnacle of Klyuchevskaya Sopka (4,750 meters, or 15,580 feet)—the biggest volcano in the Northern Hemisphere—to the icy blue of the Kuril Islands to the south, the world’s thrill-seekers call on tour companies such as HELIPRO, 56th Parallel, and bespoke private tour specialists like Abercrombie & Kent, to deliver the limits of wanton adventure. The experience is like living in a cliché Hollywood epic. As for the travelers themselves, most of their profiles reveal sojourners with vast voyage experience. Many are the “who’s who” financiers or celebrities who have seen it all but most are more conservative. All the guides tell me the average epic snowboarder is a dentist, a store owner, or insurance salesman who’s saved up for the experience. Your typical wilderness and adrenaline freak is traveling for the same reasons, on his or her individual quest to discover the planet and themselves. In my experience, the “rare breed” we see portrayed in movies can be found leading expeditions like these Kamchatka adventures. It’s as if the people meant to lead, end up being the ones even the wealthiest hedge-fund director would follow anywhere. A snowboarding champion, award-winning photographer, and expert guide since 1997, Kamchatka native Balakhovskii is such a leader. A star in about every Russian snowboarding movie ever made, Maxim and a handful of others push the envelope of what a travel experience can be. With his help, and that of Michael Schneider at 56th Parallel, we are able to offer this window out onto some of the world’s most unbelievable possibilities. Kamchatka is a destination of mythic proportions, totally impossible to understand without the help of the people dedicated to showing it off. Balakhovskii’s most recent trip, leading a group of veteran snowboarders on a heli-skiing safari to the Klyuchevskaya volcano group, we’re given a flyspeck snapshot of this vast peninsula and a stunning tour that combines cozy accommodations at Balakhovskii’s Snow Valley resort, heli-skiing, a snowmobile safari, and a marine adventure. As amazing as this safari is though, Balakhovskii’s company and the several others offer many more choices. From the Valley of the Geysers, where there are more than 90 of them situated along a four-mile stretch, to the slopes of Mount Kronotsky, the volcano that some say is the world’s most picturesque, Kamchatka is a hyperborean fantasy come to life, a place where everything comes in giant proportions, including the largest of the lava-spitting mountains of them all in the Northern Hemisphere, Klyuchevskaya Sopka. The Kutkh creation legend is a vital part of the tradition of the Chukchi people of Kamchatka. Like their ancestral brothers and sisters who ventured eastward to inhabit the Pacific Northwest of North America, the indigenous people of Russia’s Far East held to myths and devout spirituality. Of the many legends of this raven creator, the most common seems to be that Kamchatka is created when Kutkh drops a feather while flying over the earth. But the essence of Kutkh, or Kutq as the Itelmen people call him, emanates from one central theme: the raven, like Kamchatka itself, is a constant contradiction. Like the lava that flows from its immense volcanoes, this place is at once static and dynamic, still and moving, unpredictable and definite. First-time visitors will quickly discover this, while they try to unfold and sort through the list of things to see and do. Journeyers who land at Petropavlovsk’s airport, which is actually 12.5 miles outside the city, will probably stay overnight before transferring to their various base camps. HELIPRO transfers guests directly to the Snow Valley lodge either by helicopter, 4×4, or 6×6 vehicles. For those who stay over in Petropavlovsk-Kamchatsky, there are several must-see attractions. The most obvious of these is the golden-domed Trinity Cathedral, which is visible from all over town. Inside, you’ll discover a stunning display of Russian Orthodox icons, and outside, attractions await, such as the Gallery of Honorary Citizens of Petropavlovsk-Kamchatsky, the Geological Museum, the fascinating Zero Verst shop, and a nice selection of seafood restaurants and pubs. Adventurers are advised to make the most out of their first day and night in civilization. This UNESCO World Heritage site covers an area of almost 1,500 square miles and includes Eurasia’s grandest display of volcanoes in the active Klyuchevksaya range of 13. Within this pantheon of epic stone and pumice Klyuchevskay Sopka, Plosky Tolbachik, Besymyanny, Ushkovsky are still active reminders of Earth’s prehistory. Trips and extended expeditions to this marquee attraction are conducted by HELIPRO, 56th Parallel, and a few other notable tour companies. Special mention here is 56th’s seven- to 10-day tours for experienced alpinists, which includes an ascent to the top of Klychevsakaya Sopka and glacier treks. Situated inside the Kluchevskoy Nature Park, this is one of the most photographed active volcanoes in the world. There are actually two active volcanoes in the complex, the Plosky and the Ostry peaks, which have erupted sporadically in the past few decades. A large eruption back in 1976 obliterated much of the landscape around the volcanoes, and trips are now conducted to the lava fields and to what’s called the “Dead Forest,” where pyroclastic flows decimated plant life. A summer destination, the lake is the echoing beauty left from a vast eruption more than 40,000 years ago. Filling an ancient caldera that covers almost 30 square miles, Kurilskoye Lake is perhaps Southern Kamchatka’s most impressive landmark. From this lake, the Ozernaya River drains out to the Sea of Okhotsk, and the sockeye salmon of the lake attract the largest population of brown bears in all Kamchatka. 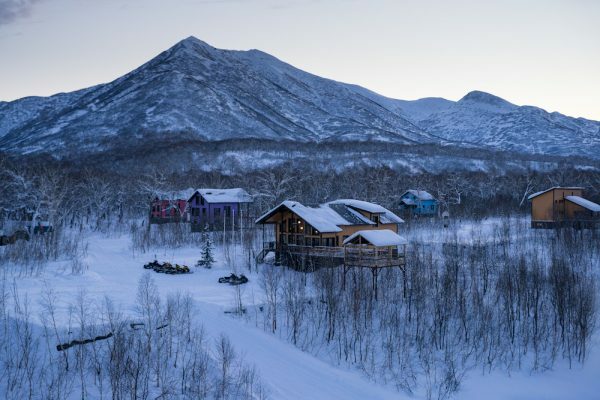 Situated about 320 miles from Kamchatka’s capital, this secluded village sits beneath deep-cut mountain ranges and forests in a valley held frozen in time. Past visitors have labeled Esso the “Switzerland of Kamchatka,” owing to its natural beauty. Inhabited by about 2,500 indigenous people, this hamlet is famous for hot thermal pools and a network of hiking trails extending into the neighboring Bystrinsky Nature Park. 56th Parallel and other companies deliver chopper tours from here to see the vast herds of reindeer nearby. This valley is home to the second-largest concentration of geysers on Earth. A bizarre landscape reverberating prehistoric times unfolds onto 90 steaming geysers spewing jets of superheated water skyward. Abercrombie & Kent, 56th Parallel, HELIPRO, and other expert guides offer trips here. 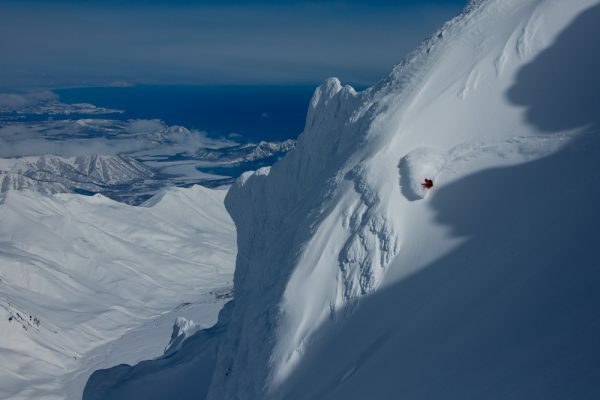 Another active volcanic monolith, the team at HELIPRO lists this as one of Kamchatka’s must-see places. This shaking giant looks down onto a smaller version of the famous Valley of Geysers. Situated about 50 miles south of Petropavlovsk-Kamchatsky city, the volcano last erupted in 2000. To this day, some visitors to the city are still startled by the visible streams of steam you can see rising above the caldera. One stunning feature of this volcano is the waterfall created by the melting of glaciers feeding the Vulkannaya river, which dissolves massive quantities of sulfuric acid, arsenic, and other elements that flow into the Mutnaya River and into the sea. 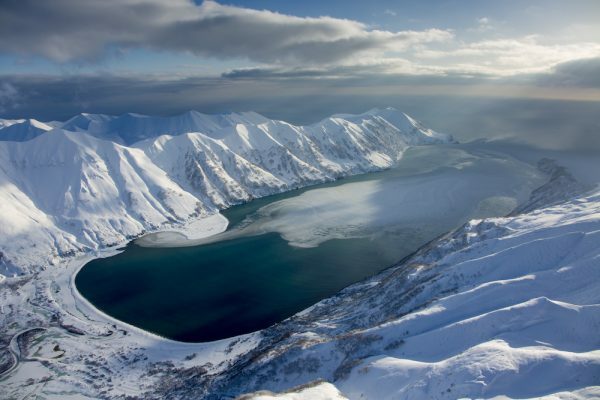 Kamchatka’s coastline is a maze of fjords and bays that few have ever laid eyes upon. The entire length of the peninsula is like a mirrored cousin of Norway—only Kamchatka has two coastlines. HELIPRO offers a boat trip to show adventurers sea lion rookeries off Kekurniy as part of their “Autumn in Kamchatka” tour, but exclusive adventures in this foreboding environment are only there for those bold enough. I’m told there’s nothing like fish caught in the wild here. Travelers can take year-round ATV trips, helicopter adventures, boat tours, and 4×4 excursions to cross rivers and tundra, traversing amazing forests, unknown bays, and otherworldly highlands few have seen. Listing and describing the wonders of Kamchatka is a bit like cataloging all of Florida’s swamps, water parks, freshwater springs, Disney World, and a few hundred bays and beaches dotted with thousands of city attractions—the main difference being hidden secrets locked inside one of Russia’s most forbidding provinces. Visitors to this vast natural wonderland can also combine unbelievable tours to places such as Starichkov Island, or go offshore chasing killer whales, visit the caldera of Uzon Volcano, heli-ski or even surfing in the Kuril Islands, exploring Vilyuchinskaya Bay, or a hundred other unique spots. It may sound like hyperbole, but Kamchatka is for those who yearn for not just the unusual, but for that outdoor experience that tethers the soul to its beginnings. Nature lovers and hikers will certainly feel they’ve reached home, but entrepreneurs like Balakhovskii offer that step beyond. If the thought of scaling an active volcano, coming within a few feet of wild brown bears, and swooping over pristine valleys and mountain ranges is your idea of adventure, then ditch the tourist roadmap and lose yourself in the isolated splendor of Kamchatka. Here, prehistoric volcanoes rumble and steam, and wildlife thrive in dense forests and lush valleys. When you visit Kamchatka, you set foot in one of the few places on Earth not connected to the outside world by a single road. It’s a wilderness where adventures begin and roadmaps end. As you might expect, Kamchatka has no ground connection with mainland Russia. In the land of fire and ice, there are no railways or roads between the peninsula and the rest of Eurasia. The Russian navy and a few fishermen use the seaport at Petropavlovsk-Kamchatsky, but there are no cruise ships or ferries connecting to the rest of the world. Visitors must arrive and depart from the airport “Yelizovo” (IATA: PKC, ICAO: UHPP) outside the capital. There are daily flights from Moscow, and semi-weekly jets in from St. Petersburg, Siberia, and even Alaska. HELIPRO and other tour companies provide transfers to and from the airport, and to destinations in between. Travelers are advised to consult experts before arriving, as much of Kamchatka is restricted for ecological or military reasons, and special permission is required to enter most areas. Short version, you can’t just wander around unguided, which is a good thing, given the hazards newcomers would certainly fail to foresee. Phil Butler is a publisher, editor, author, and analyst who is a widely cited expert on subjects from digital and social media to travel technology. He’s covered the spectrum of writing assignments for The Epoch Times, The Huffington Post, Travel Daily News, HospitalityNet, and many others worldwide. On the Via Ferrata, intense physical hardship and finding the next hold aren’t issues. But that “primal aspect,” the fear, is still there.